FREE E-BOOK, while they last. 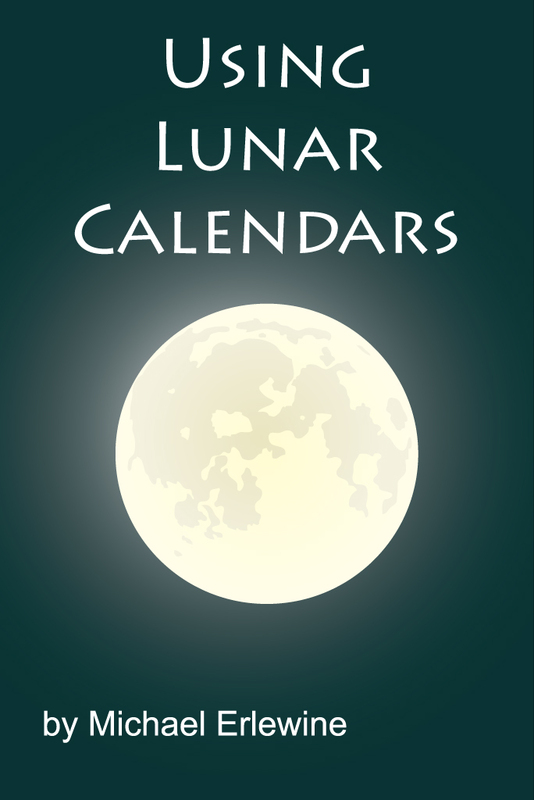 I have been publishing a yearly lunar calendar since 1969, along with my brother Stephen, some 45 years. It was first published by Circle Books, then for many years by the Circle Books and the AFA (American Federation of Astrologers) together, and recently by Matrix Software, a company I founded, in e-book format. The Chinese, Indian, Tibetan, and other Asian countries also have lunar calendars, but they are more complex than our western versions. For one, where here in the west we may chronicle the four quarters (sometimes eight phases) of the moon, the Asians record 30 lunar phase times each month. In the Tibetan astrological calendars, the 360-degrees of the solunar angular-separation are timed for every 12-degrees of angular separation between the Sun and the Moon. Every Tibetan monk and lama has an astrological lunar calendar or access to them and they use them, well, religiously of course. But there are problems with the published calendars, which I will try to explain. Solunar events like the Full and New Moon, the four quarters of the Moon, as well as the 30 lunar days in the Tibetan and Hindu calendars are all precise moments in time. In other words, when the moment of the Full Moon occurs, that instant is true for everywhere on Earth -- one instant for all places. However, all the places on Earth happen to be in different Time Zones, just as we have EST, CST, MST, and PST here in the U.S. The result of this is that while all cities and places on Earth experience the Full Moon at the same exact instant, their local time (and time zone) will vary, and so they will report the time of the Full Moon in their local time and those times (worldwide) will all be different, or at least as different as their local time zones. This is important to understand. Why it is important is that a great many (if not most) Asian lunar calendar are calculated for a specific place and time in Asia (Lhasa, Tibet or Bodhgaya, India, etc. ), yet they may be distributed worldwide. The result is that a Tibetan monk in New York may be using a lunar calendar calculated for the local time in India, and hell and high water will not budge them. And the lunar times in those calendars are up to a day off! They use them anyway. Trust me folks, I have seen it all, at least in this area. And it can get worse too. Because most lunar calendars, at least originally, were made to be used by a whole monastery for daily practice, lunar day times were rounded off to the nearest day. For example, the Full Moon might be at 1:00 AM (in the middle of the night), but the sangha of ordained monks would do whatever practice for that particular Full Moon day on the following day…. when it was daytime. Or sometimes the time given is that of sunrise on the following day. All of this was for the convenience of the sangha, not for the correctness of the solunar event. What to do about this? The simplest and most accurate thing is to use a table of solunar events for your time zone. I will include a link at the conclusion of this article. Just use that as a guide for dharma practice, but make sure you adjust it to your time zone. I will give is to you in EST (Eastern Standard Time), and you will offset that time to however far your time zone is from Eastern Standard Time. A free monthly Tibetan Dharma Practice Calendar at:. On the page, look for "Moon Time," and in the lower left-had column, click on the small red dharma wheel marked "Practice Calendar." That should help. For a free 150-years Lunar Calendar, go to this link and scroll down until you find a book with a red cover named "Dharma Practice Calendar.